Kentucky and Kentuckians are full of stories, which may be why so many present-day writers have Kentucky roots. Whether they left and returned, like Wendell Berry and Bobbie Ann Mason, or adopted Kentucky as home, like James Still and Jim Wayne Miller, or grew up and left for good, like Michael Dorris and Barbara Kingsolver, they have one connection: Kentucky has influenced their writing and their lives. L. Elisabeth Beattie explores this influence in twenty intimate interviews. 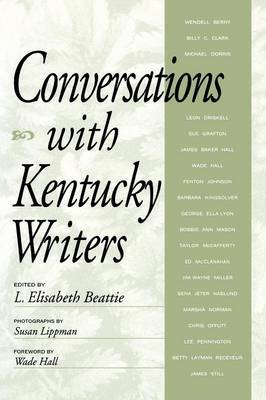 Conversations with Kentucky Writers was more than three years in the making, as Beattie traveled across the state and beyond to capture oral histories on tape. Her exhaustive knowledge of these authors helped her draw out personal revelations about their work, their lives, and the nature of writing. When Still concludes his interview with "I believe I've told you more than anybody," he could be speaking for any of Beattie's subjects. Aspiring writers will learn that Mason submitted twenty stories to the New Yorker before one was accepted, and that Still wrote articles for Sunday school magazines. There's plenty of advice: Dorris tells budding authors to get real jobs, keep journals, and read everything, even cereal boxes, and Marsha Norman reminds playwrights that "it is not the business of the theater to provide writers with a living." Kingsolver advises, "Read good stuff and write bad stuff until eventually what you're writing begins to approximate what you're reading." Beattie's collection includes striking self-portraits of such writers as Sue Grafton, Leon Driskell, James Baker Hall, Fenton Johnson, George Ella Lyon, Taylor McCafferty, Ed McClanahan, Sena Naslund, Chris Offutt, Lee Pennington, and Betty Layman Receveur.What most distinguishes these moving conversations from other author interviews is their focus on creativity, on the teaching of writing, and on the authors' strong sense of place.As Wade Hall writes in his foreword, all twenty writers recognize that their works have been significantly influenced by their "Kentucky experience." This collection offers insights into Kentucky's rich and flowering literary heritage.